More than 1,000 renewable energy projects have been built in Ohio during the past five years — part of a scramble by utilities to comply with the state’s renewable energy standard. The biggest project, a wind farm, cost $600 million. So how much are the state’s electricity customers being forced to fork out for this flurry of climate-friendly construction activity? Nada. Not even nada — less than nada. An analysis [PDF] by the Public Utilities Commission of Ohio concludes that all those green energy projects have actually reduced the price of wholesale power in the state, albeit just a little bit. It’s true that such projects cost money to build. But, unlike fossil fuel–powered plants, their fuels — solar radiation and wind — are free. The lower long-term energy costs of all those clean power facilities has “suppressed” the market rate for dirtier forms of electricity in Ohio, the study found. According to Benedict’s calculations, the renewable generators now producing power have reduced the cost of wholesale power by about 0.15 percent. When his study looked at the projected power from all renewable projects that the state has approved, including those not yet operational, the figure is closer to 0.5 percent. 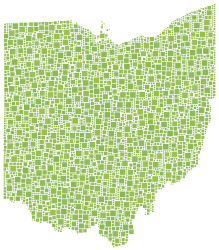 And while a wholesale price cut of half a percent may not sound like much, it’s important to keep in mind that only about 1 percent of Ohio’s power currently comes from renewable sources. The renewable standard passed in 2008 requires that that proportion gradually increase to 12.5 percent in 2025. And as the contribution from renewable power grows, so, presumably, will the savings from a falling wholesale price of fuel. The report was published as state Sen. Bill Steitz (R) pushes, yet again, to roll back elements of Ohio’s renewable energy mandate, which he has compared to “Joseph Stalin’s five-year plan.” Fortunately for consumers and the climate, similar efforts backed by the conservative American Legislative Exchange Council (ALEC) to kill renewable energy mandates in states across the nation have been flopping.